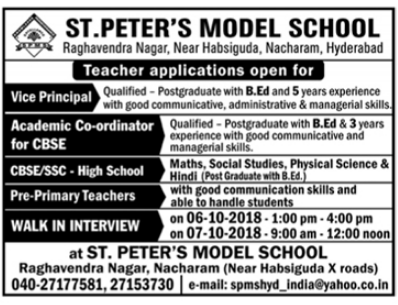 St.Peter's Model School, Hyderabad has advertised in the DECCAN CHRONICLE newspaper for the recruitment of Teachers PGT / PPRT / Vice-Principal / Academic Coordinator jobs vacancies. Interested and eligible job aspirants are requested to walk-in on 06th and 07th October 2018. Check out further more details below. School Profile: SPMS is one of the leading institutions of new generation education. At present there are 551 students enrolled from toddlers to Class X. We are committed to provide our students with individualized attention to actively engage in their learning process. How to Apply: Interested and eligible candidates are requested to attend the Walk-in interview along with CV, all originals & copies of certificates / mark sheets / experience certificates and recent PP size photographs to the following walk-in address.